EDINBURGH, Scotland, 2018-Apr-18 — /Travel PR News/ — Scotland’s heritage attractions have hit a record milestone, welcoming more than 5 million people for the first ever time in a single year. Historic Environment Scotland (HES), who manage over 300 Historic Scotland visitor attractions across the country representing more than 5,000 years of Scottish history, are celebrating a 17% increase in footfall from the previous financial year, recording 5,041,297 visitors throughout the 2017/18 financial year. The surge in numbers across the whole estate is being attributed to growth in UK, European and overseas visitors, with a significant uplift in Scots visiting sites partly due to a strong membership base of over 194,000. The ongoing ‘Outlander effect’ has seen North American visitor figures increasing by 27%, and French visitors increasing by 19% year on year. The sites that have featured in this popular American-British television series continue to enjoy an uplift in visitor numbers with Doune Castle attracting a massive 227% increase in numbers and Blackness Castle increasing by 182% since 2013. “Our record breaking visitor figures, including across all of our top ten sites, are a tremendous achievement for Scotland’s heritage tourism sector, reflecting the continued interest shown by tourists and home-grown visitors to learn more about our rich Scottish heritage. “Over five million visitors have flocked to our wealth of historic sites across the length and breadth of the country, ranging from iconic attractions such as Edinburgh Castle and Stirling Castle, to landmarks such as Skara Brae in Orkney and Iona Abbey, as well as castles in Scotland’s historic towns such as St Andrews Castle. Individual castles, palaces and other historic sites across Scotland have also achieved record figures. 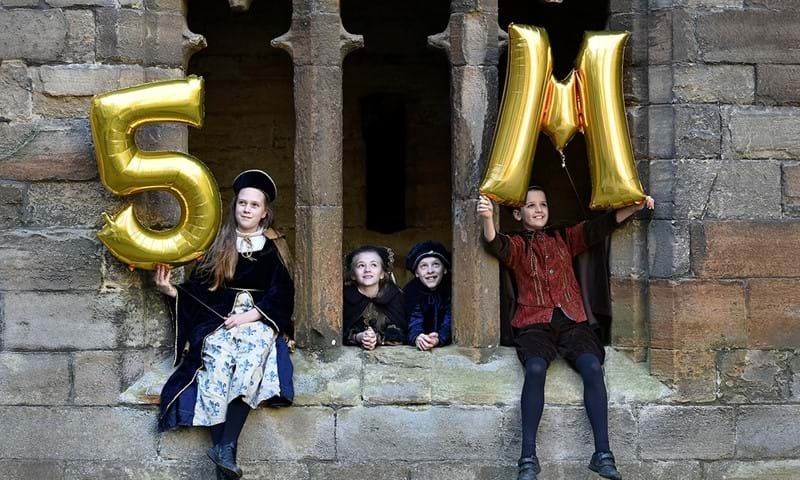 The top 10 most-visited HES attractions all individually celebrated record-breaking years, with over 2 million people passing over Edinburgh Castle’s drawbridge, an increase of nearly 300,000 visitors in comparison to the previous year. Glasgow Cathedral saw an increase of 27% to 400,324 visits to the medieval cathedral, whilst St Andrews Castle welcomed 90,253 visitors, an increase of 16%. “It is an incredible achievement to celebrate record-breaking figures across all our top 10 sites. This growing interest in Scotland’s historic environment, with visitors keen to explore our country’s rich heritage looks set to continue. “These figures are very encouraging and suggest that 2018 is set to be another excellent, record-breaking year for our world-class attractions and Historic Scotland sites. The announcement follows the recent publication of HES’s Investment Plan, which sets out an investment programme to enhance the condition of sites and improve visitor experience, scheduled to run until 2021/22. Significant investment in 2017/18 has seen the upgrade of visitor facilities such as heating, toilets and lighting systems at a number of properties across the HES estate. As part of the Year of Young People 2018, HES will also be widening access to its properties with a special entry offer for Young Scot card-holders. In partnership with Young Scot, alongside National Trust for Scotland and Historic Houses Association, HES will be offering the historically low discount entry of £1 to young people who want to explore Scotland’s historic sites. This entry was posted in Arts and Culture, Attractions, Tourism, Travel, Travel Services, Travelers and tagged Edinburgh Castle, Fiona Hyslop, Historic Environment Scotland, Scotland’s heritage attractions, Stephen Duncan, Stirling Castle. Bookmark the permalink.